Regenerative therapy for glaucoma is one of the National Eye Institute Audacious Goals. 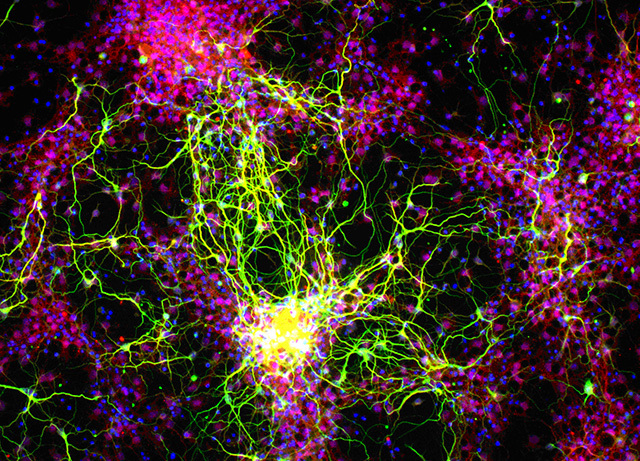 Retinal ganglion cells (green) made from stem cells may one day help physicians rewire optic nerves damaged by glaucoma. Research to prevent vision loss from glaucoma will be aided by a project funded through a major National Eye Institute effort in regenerative medicine. The lab of Tom Reh, professor of biological structure at the UW School of Medicine, will join with scientists at other institutions to look at a possible cell-replacement approach to correcting degeneration of the optic nerve. The multi-institutional team is one of five to receive grants announced today to develop disease models in laboratories for studying a range of blinding conditions. In addition to glaucoma, these include retinosa pigmentosa, age-related macular degeneration, loss of color photoreceptors, optic nerve trauma and other damage or progressive deterioration in the eye. This program will award a national total of $30 million over five years for the Audacious Goals Intitative. According to today’s funding announcement, new laboratory models will enable scientists to test novel, regenerative approaches and help transition potential treatments to clinical trials. Gene and cell therapies are among the possibilities being explored. The project that the Reh lab is collaborating on will generate a model system to study how to use cell therapy against the threat glaucoma poses to the optic nerve and to eyesight. The optic nerve conducts visual signals from the light-sensitive area of the eyeball to the brain. Nerve fibers from cells called retinal ganglion make up the optic nerve. The researchers will attempt to place new retinal ganglion into the eye, and direct the cell’s nerve fibers into the proper regions of the brain. If successful, the researchers say, the approach would overcome a major hurdle in the developing treatment for vision loss from glaucoma and other optic nerve damage. The principal investigators on this project, alongside Tom Reh at UW Medicine, are Jeffery L. Goldberg at Stanford University in California, David J. Calkins at Vanderbilt University in Tennessee, and Donald J. Zack at Johns Hopkins University in Maryland. Reh is a member of the UW Medicine Institute for Stem Cell and Regenerative Medicine, which is working on therapies for a number of serious disorders.